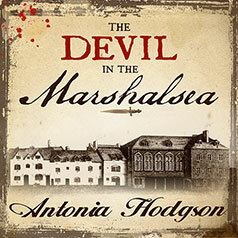 Antonia Hodgson's debut novel features a clergyman's wayward son, an infamous debtors' prison, and a murderer on the loose. It's 1727. Tom Hawkins is damned if he's going to follow in his father's footsteps and become a country parson. Not for him a quiet life of prayer and propriety. His preference is for wine, women, and cards. But there's a sense of honor there too, and Tom won't pull family strings to get himself out of debt—not even when faced with the appalling horrors of London's notorious debtors' prison: The Marshalsea Gaol. Within moments of his arrival in the Marshalsea, Hawkins learns there's a murderer on the loose, a ghost is haunting the gaol, and that he'll have to scrounge up the money to pay for his food, bed, and drink. He's quick to accept an offer of free room and board from the mysterious Samuel Fleet—only to find out just hours later that it was Fleet's last roommate who turned up dead. Tom's choice is clear: get to the truth of the murder—or be the next to die.